Delia didn’t bring up the most pressing subject of all when he met Joseph Muscat yesterday, showing that he intends to draw a line under the matter and ‘move on’, much to the Labour Party’s convenience. And Delia’s own, of course, because he was in no position to bring it up: he would have been met with one of Muscat’s nasty tu quoque responses about his bank account in Jersey, used to launder money for a prostitution racket. 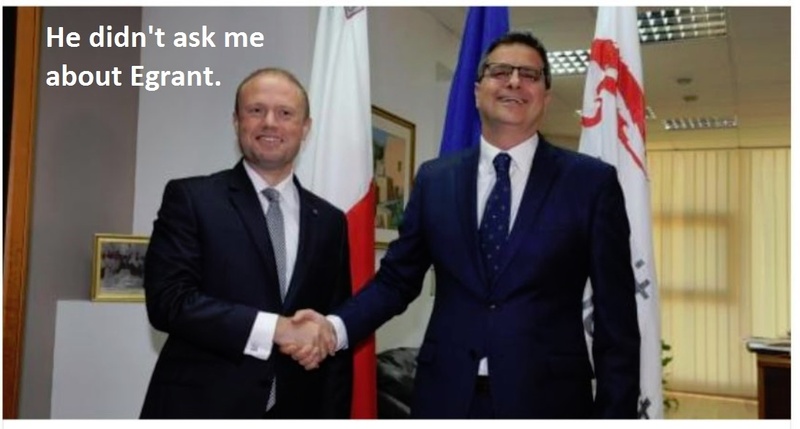 And so Delia discussed Air Malta instead, maybe because he thinks it’s a great idea to keep hundreds of people on the payroll of an insolvent airline, and keep adding more too. But then he’s clearly comfortable around debts of millions which can’t be paid. Note to Delia’s advisers: You need to train him in different camera poses. He’s clearly learned this one by rote and practised it repeatedly in front of the mirror. Now he uses it every time he sees a camera pointed in his direction: throw head slightly back, raise chin (both of which emphasise his slouch and slight stoop), smile with parted lips, and put one leg forward while cocking the other one slightly. He’s beginning to look like an imbecile or worse, like somebody who would push you out of the way to get to the lifeboat first. Teach him some stern expressions with his feet together and his shoulders back. It’s bad enough that nothing else about him inspires confidence, without his having the body language of a conman too.